There is perhaps never a better time to start a new job than at the start of a fresh year with a clear diary and a bunch of unfamiliar colleagues who are all trying their best to be as cheerful as possible in the face of the January blues. The security firm has appointed industry veteran Vin Murria to the board of directors as a non-executive director and a member of the nominations and remuneration committees. Murria was last featured in MicroScope when Advanced Computer Software, which she had founded and been CEO was sold to Vista Equity Partners in 2015. She is also a non-executive director of Softcat and Zoopla Property Group. The security player has appointed Cherif Sleiman as vice president EMEA to ramp up sales in the DNS security products and network control for hybrid cloud environment. 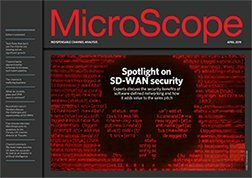 “With the rising number of DDoS attacks and data breaches, DNS Security has become mandatory to ensure safe computing in service provider and enterprise networks,” said Sleiman. The managed services specialist jas added a couple of senior managers with Clodagh Murphy taking up the role as chief operating officer. She was formerly managing director of KCOM’s Eclipse business. She will not be the only new face with Jeff Palmer coming on board as sales director. He joins from Daisy, where he had been director for group vendor alliances & supply chain services. “The arrival of Clodagh and Jeff comes just weeks after our new Chief Commercial Officer, Simon Payne, joined us from Capita. 2017 will be a pivotal year for the company as we cement our new strategy for the business," said Ben Marnham, CEO of Timico. A chance to enhance existing channel relationships will be part of the role for Gary Gethin, who has taken up the business development manager at the firm. The firm, which specialises in solutions around 19 inch rack mount technology is working with channel players that have a background in data centres, infrastructure and facilities based services providers.